DOYLESTOWN (PA) – The Delaware Valley University football team will make its 12th postseason appearance in the last 13 years when it hosts Moravian College in the inaugural Centennial-Middle Atlantic Conference (MAC) Bowl Series on Saturday, November 21. Kickoff is set for 12 p.m. at Robert A. Lipinski Field at James Work Memorial Stadium. With the Eastern College Athletic Conference (ECAC) moving all of it bowl games to Connecticut this year, schools in both the Centennial and the MAC felt that they would suffer significant financial impact. Therefore, the conferences came together for the new arrangement that still provides postseason opportunities while controlling costs (NCAA rules permit a conference-sponsored postseason tournament – one between teams that are not identified until the end of the preceding regular season – not to exceed one contest for any one institution). The set-up has the top team from each conference that was not selected to the NCAA Division III Championship hosting the second best team from the opposing conference not moving on to NCAAs. DelVal improved to 8-2 overall and brought the Keystone Cup back to Doylestown with a 20-3 defeat of archrival Widener University last week. However, the Aggies’ bid for a conference title fell short as Albright College secured the NCAA automatic bid with a win over Lebanon Valley College to finish 8-1 in the MAC. DelVal came in second with a 7-2 conference record. The Aggies ended the regular season ranked first in the MAC in rushing (279.4 ypg) and second in total yardage (402.7 ypg). Their rushing total is also good for 10th in all of Division III. Freshman quarterback Dashawn Darden (Norristown, PA/Cardinal O’Hara) has played in every game but took over the starting job after the Stevenson contest. He is 37-of-68 for 570 yards and nine touchdowns. Darden has thrown just one interception, none since becoming the starter. He has also ran the ball 77 times for 563 yards (7.3 avg) and three scores. Darden had a touchdown toss and ran for 94 yards on 10 attempts against Widener. Sophomores Devauntay Ellis (Ewing, NJ/Ewing) and Armani Fuller-Williams (Philadelphia, PA/Mastery Charter) and junior Robert Cleveland (Willingboro, NJ/Willingboro) have split carries in the backfield throughout the campaign. Ellis, a junior college transfer, leads the team with 711 yards on 95 carries (7.5 avg). He has reached the end zone five times. Cleveland has rushed 101 times for 541 yards (5.4 avg) and two touchdowns. He led the trio with 56 yards versus the Pride. Fuller-Williams has netted 507 yards on 92 chances (5.5 avg). He has found his way to pay dirt eight times. Wide receiver Tyler Bing (Galloway, NJ/Absegami) has been a threat both through the air and on the ground. He has made 17 receptions for 205 yards and one score. Bing has added 354 rushing yards on 41 attempts (8.6 avg) with five touchdowns. Freshman wideout Eric Shorter (Trenton, NJ/Princeton) has a team-high 19 catches for 351 yards. He has hauled in three passes for a touchdown. Junior Michael Jensen (Woodbridge, NJ/Bishop George Ahr) has contributed with 12 receptions for 157 yards. Four of his catches have been for a score, including a nine-yard strike last week. 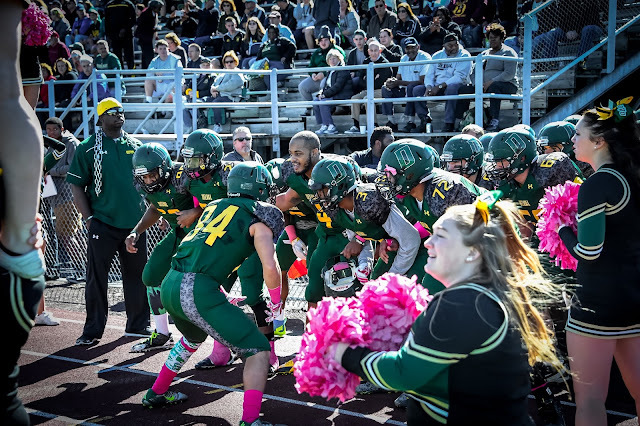 The DelVal defense wrapped up the regular season ranked second in the MAC in rushing (102.5) and scoring (16.5 ppg). Those numbers are 21st and 28th in the nation respectively. The unit was also fourth in the conference in total yardage (317.6 ypg). Senior safety Danny Wynne (Hatfield, PA/North Penn) continues to lead the defense with 77 tackles. The two-time all-MAC selection has also registered one sack, two forced fumbles and one blocked kick. Wynne made five stops (three for a loss), had one sack and forced two fumbles against Widener. Senior Rashaad Lighty (Pottstown, PA/Pottstown) had seven tackles and 3.5 sacks last week. The 3.5 sacks was the third-highest, single-game total in school history. That upped his season totals to 48 tackles (13.5 for a loss), 10.5 sacks and six forced fumbles. The 2014 all-MAC and all-ECAC linebacker leads the nation in forced fumbles and is 18th in sacks. Senior linebacker Ethan Snyder (Catawissa, PA/Southern Columbia) and sophomore safety Shawn Miller (Laurel, DE/Laurel) are second and third on the team with 61 and 57 tackles respectively. Both have also forced a fumble. Miller has made three interceptions (one last week), including a 100-yard return for a touchdown versus Stevenson. Miller combined with Snyder for six stops against Widener. Sophomore linebacker Nick Wright (Hatfield, PA/North Penn) had two interceptions and a fumble recovery against Widener. He returned one of the picks 21 yards for the first touchdown of the game. For the year, Wright has 41 tackles and two interceptions. The Greyhounds had their six-game winning streak snapped last week with a 28-14 loss at Muhlenberg College. That dropped Moravian to 8-2 overall and 7-2 in the Centennial Conference, finishing in third place due to the head-to-head defeat to the Mules. It will be the team’s first trip to Doylestown since a 39-0 loss in 2006 when the Greyhounds were a member of the MAC. Moravian finished the regular season ranked second in the Centennial in scoring (31.6 ppg), third in rushing (208.7 ypg) and fourth in total yardage (405.0 ypg). Junior Mike Hayes has started every game at quarterback. He has completed 165 passes in 270 attempts for 1,958 yards and 16 touchdowns. Hayes has thrown just six interceptions. He was 21-of-38 for 216 yards and two scores last week. Junior running back Chris Negron leads the team and is 16th in Division III in rushing with 1,368 yards (136.8 avg). He has scored 14 touchdowns on his 258 carries. Negron has reached the 100-yard mark in seven games this year. Junior wideout Jalen Snyder-Scipio is the top receiver with 44 catches for 446 yards and four scores. Sophomore Justice Anderson (28), junior Liam Nolan (27) and Negron (22) have all made over 20 receptions, combining for 960 yards and six trips to pay dirt. The Greyhounds have been one of the top defensive units in the Centennial this season, ranking second in the conference in passing (183.5 ypg) and third in scoring (21.4 ppg), rushing (152.8 ypg) and total yardage (336.3 ypg). Senior Brendan Downey leads the squad with 85 tackles. The linebacker made 14 stops against Muhlenberg, one of three double-digit games this year. Freshman Steve Ewald and senior Anthony Orlando have registered 66 and 62 tackles respectively. Ewald, a linebacker, also has 7.5 tackles for a loss, four sacks and one interception. Orlando, a defensive back, has added two interceptions and one fumble recovery. Moravian boasts six other players with at least 40 tackles, led by seniors Tim McCabe and Dan Brackenwith 48 apiece. McCabe’s totals also include 15.5 tackles for a loss, 6.5 sacks and three forced fumbles. Bracken has produced 9.5 tackles for a loss, five sacks and two fumble recoveries.